So, what is an aromatherapy air freshener? Any air freshener which contains natural essential oils as the main active ingredient may be considered to be an aromatherapy air freshener. However, some commercial air fresheners may contain essential oils but still not be particularly good. That is, they may not be good for our health, or they may not be good for the environment. This is because of the way they have been produced or because of the additional additives used. Big companies often try to get our custom by including some essential oil in their products. There are usually other ingredients included which make the product unsuitable from a green living standpoint and which may have a negative effect upon health. Also, the quantity of real essential oil is often very small and the quality of oil used may be low. So how can we find the real thing?One simple answer is to make a homemade aromatherapy air freshener. Read on for lots of tips for using essential oils and other aromatherapy products for freshening the rooms in you home. See also the safety advice at the bottom of the page. So how can you make your own essential oil aromatherapy air freshener? You can make your own aromatherapy air freshener quite easily whether you have an oil burner or not. First, buy a selection of high quality essential oils, preferably organic ones, so that you can ring the changes and use different ones for different purposes. Buy the very best quality essential oils you can afford. This is because these oils are quite potent and, after all, you are breathing the scents so it is important that they are pure, preferably from accredited organic sources. Good quality aromatherapy oils are available (in the UK) from Holland & Barrett. Amazon has a selection, too. There are examples here on the right. Here's are some details of some of the best oils for home use for scenting and purifying the air. They are in alphabetical order. Citronella oil will repel most insects and the perfume is quite pleasant. Some people may be sensitive to this oil, so try it out cautiously. Eucalyptus oil has the familiar strong smell which we probably all associate with colds and sore throats as it is used in so many common cold remedies. It has strong antiseptic properties and also protects against insects. Probably a bit drastic for everyday use but valuable for clearing the air when there is an infection in the house. It may help prevent the transmission of bacteria as it is highly antiseptic and may even help against viruses. Frankincense, as well as having a wonderful rich smell, has antibacterial properties. A good choice as a room freshener. Geranium oil has a wonderful sweet fragrance and has a role in repelling insects. Lavender oil has a pleasant, refreshing fragrance. It may have some deterrent powers against cat and dog fleas. It can help relieve headaches. Spike lavender is a less beneficial and cheaper variety sometimes offered. Melissa has a lovely sweet scent and is good for nervous disorders and for cheering people up. Melissa is also known as Lemon balm and can be grown in your garden if your climate is Mediterranean or cooler. You can add a drop or two to pot-pourris to refresh a room or add a drop or two to hot water and stand a bowl in a room. Mints such as peppermint are good for keeping you alert. The familiar ‘toothpaste’ scent has a clean, refreshing effect. It also has a calming influence on nerves. Don't use it if you are taking homoeopathic remedies as it is believed to antidote them. Rose of course has a beautiful fragrance but tends to be rather expensive as an essential oil. Rosemary oil discourages moths and has anti-bacterial properties. Sandalwood has a strong, clean, wood scent which is very agreeable. It is used in Ayurvedic medicine and has a reputation for helping meditation, relaxation and sleep. Tea Tree is well known for its antiseptic properties. The smell is probably a little strong for everyday use. Use it as a preventative when there is a bug going round. Thyme is a very strong natural disinfectant. Use it sparingly. It is particularly good to use when there are infections in the neighbourhood or house. One of the best books around on essential oils is Essential Oils Desk Reference which is a thorough and trustworthy source of information. Put a few drops of essential oil into an oil burner with water. The oil floats on top of the water, so it evaporates as the water heats up. Light a candle (night-light or tea-light) and stand the burner in a safe place away from drafts and inflammable materials. After a few minutes the whole room will be scented. It is quicker if you add hot water to start with, as the water takes a while to heat by candle power. This oil burner is simple but effective. It is also inexpensive and available from Amazon. Make sure it is not where small children or pets can disturb it. The oil will gradually diffuse into the room, freshening and scenting the air. In the UK you can get a good selection of essential oils from Holland and Barrett - and they stock candle reed diffusers which draw essential oils upwards and diffuse them into the room. I haven't tried these yet, so I can't say how effective they are. You can also buy a variety of oil diffusers which control the release of scent into a room. These work by gently heating the oils. Another very easy way to make yourself an aromatherapy air freshener is to buy an atomiser and fill it with water and one or two drops of essential oil. You can buy atomisers from most pharmacists and drug stores. Then you simply spray any room that you want to freshen with the atomised air-freshener. This works very well and is virtually instant, though you may need to repeat the spraying. You can use any essential oil which is safe for such uses. You should always check with an aromatherapist if in any doubt and make sure that the oils you use are sufficiently diluted. Another method is to use the power of your central heating system. If you don't have central heating this method can be adapted for other forms of heating too. Central heating tends to dry the air inside houses to a degree that is not ideal for health. To counteract this you can use a small reservoir of water to humidify the air. These are often designed to hang on radiators. If you already own one or more, just add a little of your favourite oil to the water in the reservoir. Your home will be gently scented whenever the radiator is on. You can buy these humidifiers in many of the bigger household stores. You can experiment with mixing oils for your aromatherapy air freshener. Some work better than others. You will gradually find the combinations that suit you best. Possibly the easiest way to make your own aromatherapy air freshener is to use some of your garden flowers and garden herbs. If you already grow lavender, rose or rosemary, or other strongly scented plants, it is very easy to create your own pot-pourris for home use. Lavender can be dried, put into a cloth bag and then hung. Stir the contents to release the fragrance. 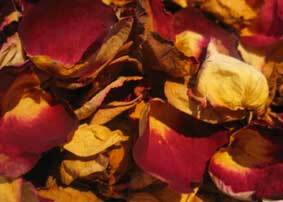 Rose petals dry easily and retain a good deal of their scent. Many other scented flowers are worth drying, too. Just dry selected leaves and flowers in large paper bags. Shake and turn them frequently until dried. Place them in shallow basketwork bowls for gentle room freshening and scenting. See here for more on drying herbs. Here is some information on safety. Most essential oils are quite safe in diluted amounts for making an aromatherapy air freshener. However, aromatherapists usually advise pregnant women to avoid aromatherapy oils. The oils are very concentrated and do have significant medicinal effects. If in doubt always consult a qualified aromatherapist and/or your doctor. Never leave candles and naked flames unattended or near small children.